And Yet They Deny: Peekaboo; Eye See YOU!! 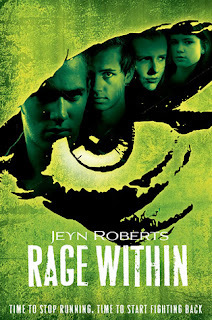 - Jeyn Roberts - "Dark Inside #2; Rage Within"
Peekaboo; Eye See YOU!! - Jeyn Roberts - "Dark Inside #2; Rage Within"
"Aries, Clementine, Mason and Michael have survived the first wave of the apocalypse that wiped out most of the world's population, and turned many of the rest into murderous Baggers. Now, they're hiding out in an abandoned house in Vancouver with a ragtag group of surviving teens, and trying to figure out their next move. Aries is trying to lead, but it's hard to be a leader when there are no easy answers, and every move feels wrong. Clementine is desperate to find her brother Heath, but it's impossible to know where he'd be, even if he is still alive. Michael is still haunted by the memories of his actions during his harrowing struggle to survive. And Mason is struggling with something far worse: the fear that he may be a danger to his friends. As the Baggers begin to create a new world order, Aries, Clementine, Mason and Michael will have to trust and rely on each other in order to survive."